But the good news is you will also have most to gain by switching supplier or tariff. Over the last six months almost 4,500 people have compared energy prices for their home with ‘Power to Switch’. Its great so many have looked for a better deal and found one – on average people save £145 off their annual energy bill. 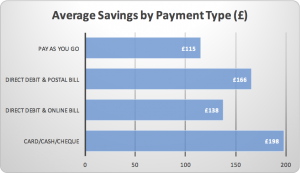 The impact of how you pay in terms what you could save makes for interesting reading…. 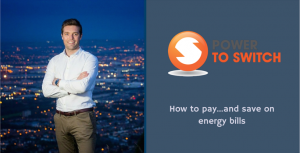 If you have never switched energy supplier or changed tariff its likely you’re paying more than your need to for your energy. How you pay and how you are billed will make a difference to what you have to pay. Generally the best deals are found if you pay by Direct Debit with Online Billing, or Pay as You Go. It takes about 3 minutes to find a better deal using Power to Switch. Switching supplier is straightforward and you are protected throughout the process. Power to Switch compares tariffs across all suppliers. We provide information on all tariffs, terms and conditions, payment options and customer reviews for each company. This makes choosing the best deal easy. To compare deals visit powertoswitch.co.uk or follow us on Facebook and Twitter.